This impressive antique George V cut glass dressing table jar has a circular rounded form. 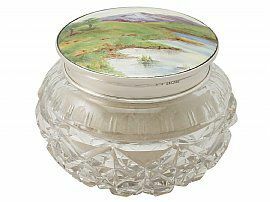 The jar is fitted with a push fit hallmarked sterling silver cover featuring a hot enamel panel depicting a lakeside scene with a mountain backdrop. The interior of the cover is gilded. The glass body of the jar is ornamented with cut glass decoration in a geometric design with a band of egg and tongue style ornamentation to the shoulders, in addition to a star cut motif to the underside. This antique dressing table jar retains the original powder puff. This jar has the same credentials and is crafted in the same style as the dressing table set A3428 and would sit well together. This antique dressing table jar is a very good gauge of silver, exceptional quality and in excellent presentation condition. The glass and enamel is in perfect condition. Full hallmarks struck to the surface of the cover are all very clear. Reflections in photographs may detract from the true representation of this antique silver and glassware.